8 Major Indian Traditional Dresses and Clothing – Best of India! India, the world’s largest democracy is known for its diverse culture and rich heritage. Different people from different communities live in India. India is a nation which is an apt example of Unity in Diversity. The wide diversity in traditions followed, customs believed, food, form of languages and attire- but unified as one nation-makes it a perfect place to live! Indians are best known for their traditional dresses and elegant attire. Whether it’s a wedding special from Sabyasachi or a dhoti from Khadi Grahmin, Indians have a perfect attire for every occasion. Indian outfits have been adopted by people across the globe and are equally loved by us. So, today we have curated a list of 8 Major Indian Traditional Outfits that are commonly worn in India and always have in their wardrobe! The first dress on our list of is Kurta-Pyjama. Whether it’s a traditional pooja or you’re going for marriage season, Kurta-Pyjama look is extremely popular among Indian men. Pair the Kurta-Pyjama with a leather sandal or “Punjabi Jooti“, along with classy aviators, a bullet or heavy bike ride and you are all set to slay with your looks. 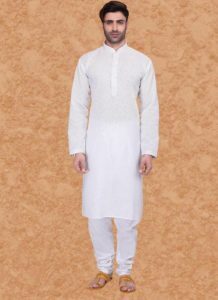 The Kurta is often teamed up with different bottom wears like pyjama, straight churidaar, or balloon churidaar. Whether traditional Raymond design or authentic Indian Manyaavar Kurta-Pyjama, you’ve got many options available in the market. If you are an SRK fan, then you can always go for his Raees’s look: Pathani suit(which is commonly seen in Srinagar)! The next Indian outfit on our list is Lungi. Commonly worn in Southern parts of India, lungis are a good escape from the summer heat. If you’re going to South India, you probably aren’t coming back without buying a lungi! They are available in silk material as well as cotton and are comfortable to wear. Pair it up with a slim fit formal shirt, groom your mustache and you’re all set to go. Just like Indians, many other western countries are also a big fan of Lungis as it adds extra grace to man’s personality and looks! Dhoti is the next outfit on our list of 8 Major Indian Traditional Dress and Outfits. You will still find the people living in the remotest parts of the country opting for dhoti over jeans and pants in their day-to-day life. 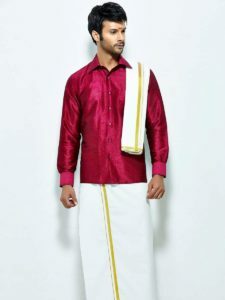 As it is said, the trends in fashion industry changes constantly, these days many city men are opting for dhoti to team up with their designer blazers and sherwanis during wedding ceremonies. Nobody will mind trying Ranveer Singh’s look from Padmaavat’s promotion days! 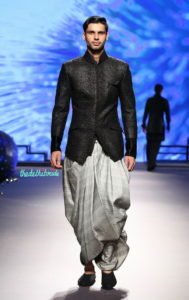 Dhoti is worn by men across India and is quite famous among Americans. Don’t forget the famous Bhangra crew dancing on your favourite Punjabi numbers wearing dhoti, turban and upper embroidered short kurta! Sharara is the next Indian Clothing on our list. The hype of wearing Sharara is at its peak these days. It’s a must-have for every woman in their wardrobe. No wonder why many American women are also opting to try Sharara and are loving it! Sharara is a replacement of the traditional ghagra and is basically a loose pleated embroidered trouser. It is usually worn with a long upper or kameez and paired with a dupatta. Sharara originated during the time of the Nawabs and is the traditional Lucknowi attire that adds grace to every girl’s looks. Every girl wants to try Deepika Padukone’s look from Deewani Mastaani song at least once! Isn’t it? 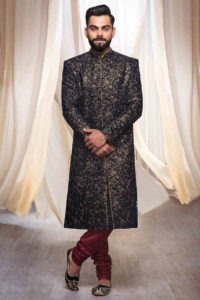 The next Indian outfit on our list is Sherwani. Whether it’s Chacha Nehru’s gentlemen look or you’re preparing for wedding season, Sherwani is everyone’s favourite. It is basically a coat like attire worn by men of North Indian region on formal occasions. These days the trend of Indo-Western is also at its peak. Along embroidered jacket along with straight trouser or churidaar and a silk dupatta. Damn, the classic Virat Kohli’s look from Maanyavar’s catalogue! At least, one Sherwani is a must have in every boy’s wardrobe. The next Indian attire on our list is Ghagra Choli. Usually worn by the people from Gujarat and Rajasthan, there are different forms of this attire worn by the people across India. Whether the look from Sanjay Leela Bhansali’s Ramleela or the one from Padmaavat’s, the choice is all yours! Different types of Ghagra Choli are available in the market based on the occasion. A heavily embroidered version is worn during wedding season and a mirror embellished variant is worn during the Navratri time. When teamed with odhni, this attire adds to a girl’s grace! The next outfit on our list of 8 Major Indian Traditional Dresses is Salwar or Churidar and Kameez. This combination is one of the famous traditional dresses of India and is worn by the women across the nation. The length of the kamees can vary from ankle length Anarkali suits to short or long kurti’s, that comes in printed pattern or are a masterpiece of beautiful embroidery work. Some women prefer to team up Kameez with a churidar while others try it with salwar. Whatsoever the choice is, it adds an elegant touch to the looks of women and thus, is equally loved by European women. No wonder if you’ll find few foreigners wearing Salwar Kameez in the streets of India, exploring the country! Last but not least, Sari is the next Indian outfit on our list of 8 Major Indian Outfits. With the passage of time, saris have seen a lot of evolution. 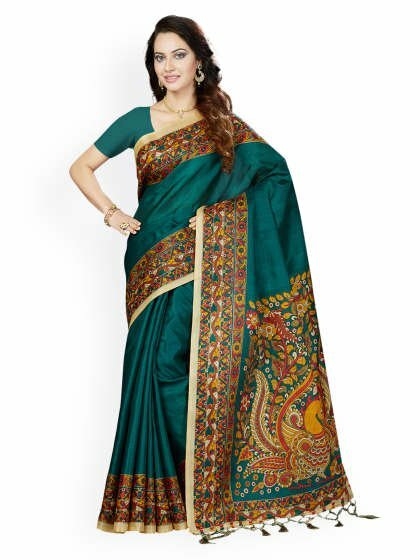 Nowadays, women can choose from a large variety of sari options available in the market. A perfect sari for every occasion. Whether the one from Priyanka Chopra’s desi girl look or the ones worn by Indira Gandhi. There are many types of saris available like banarasi silk, pochampalli sari, patola sari etc. The draping style varies from state to state. Saris add to the beauty of Indian women and there is no doubt in the fact that no matter how many western dresses a woman wears but she looks the best in saris. The trend of saris is also quite popular among American women as it adds an elegant touch to their looks! With this, we come to the end of our list: of 8 Major Indian Traditional Dresses and Clothing. Indian traditional outfits are loved across the globe and at times we have seen international stars flaunting the same! That’s all from the story. Stay connected to read more!